When a crisis hits, and it will, you need a sure-fire game plan to respond effectively and immediately. In today’s world, information moves at a rapid pace so when you mess up, and you will, be ready to fess up and fix it right away! Hear from Anita J. 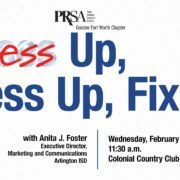 Foster, Executive Director, Marketing and Communications at the Arlington ISD, to hear hilarious, horrifying and humbling examples of how to handle any crisis that comes your way. There’s just no reason to learn on our own when we have major brands like KitchenAid, JC Penney, Egypt Air, American Red Cross and others to learn from. Be ready to laugh and cry as we walk through some classic mess ups, fess ups and fix its, and how to incorporate this strategy into your crisis communications plan. 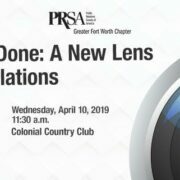 When: Wednesday, February 13, 2019, 11:30 A.M. – 1:00 P.M.
https://fortworthprsa.org/wp-content/uploads/2019/01/50669950_2289882187712106_5615713217473937408_o.jpg 1081 1921 Hannah Lacamp http://fortworthprsa.dividesignpros.com/wp-content/uploads/2019/01/GFWPRSALogo2018-300x287.jpg Hannah Lacamp2019-01-28 14:55:472019-01-28 14:55:47Join us for our next GFW PRSA luncheon on Wednesday, February 13, at Colonial Country Club! Join us for our next GFW PRSA luncheon on Wednesday, September 12, at Colonial Country Club! In 2014, Texas Health Resources (THR) treated the first Ebola patient in the United States at Presbyterian Hospital of Dallas. The crisis was an international news story for months and resulted in prolonged scrutiny for THR. Mark Riordan, THR’s Vice President, Stakeholder Engagement, will discuss best practices in crisis management and reveal how ethics guided the PR counselors in helping the health care system navigate this unprecedented crisis. 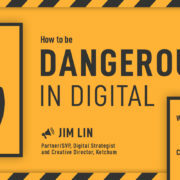 https://fortworthprsa.org/wp-content/uploads/2018/08/PRSA-2018-Creative_September_ALLSIZES_600x140.jpg 141 601 Hannah Lacamp http://fortworthprsa.dividesignpros.com/wp-content/uploads/2019/01/GFWPRSALogo2018-300x287.jpg Hannah Lacamp2018-08-22 12:14:002018-08-22 12:14:00Join us for our next GFW PRSA luncheon on Wednesday, September 12, at Colonial Country Club! Put your crisis communications instincts to the test. Jump in the trenches with the experienced father and son team, Dr. Joe Trahan and Joseph Trahan, at the PRSA Greater Fort Worth chapter’s half-day workshop (8 a.m. – 1 p.m.) on Wednesday, March 22. No organization is immune, so prepare for the unknown and gain skills to react quickly, respond immediately and be part of the story before it gets away from you. If you’ve never handled or accounted for a crisis communications situation for your organization, this hands-on, interactive workshop with the experts is what you need. A New Orleans native, Dr. Joseph V. Trahan, III, APR, PRSA Fellow, has over 35 years of public relations/affairs experience in the governmental, association, educational and non-profit sectors. His son Joseph Van Trahan, IV is a sports media professional who has spent over a decade in the professional and collegiate ranks. He is currently in his 10th season as the media relations and corporate relations coordinator with the Dallas Cowboys.